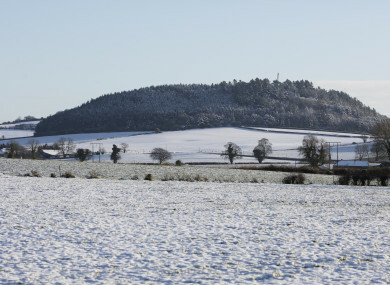 A STATUS ORANGE snow-ice warning has been issued for three counties this afternoon. Following a night of heavy snow in some areas of the country, another bout it expected tonight. The Status Orange warning has been issued for Cavan, Monaghan and Donegal. It will be valid between the hours of 6pm this evening and 12pm tomorrow. A Status Yellow wind warning is also in place for Munster, Connacht and Leinster between the hours of 5pm this evening and 3am tomorrow morning. Winds up 50 to 65km/h are forecast with gusts of 90 to 110 km/h in many counties. Met Éireann is warning of an increased risk of coastal flooding due to the combination of high seas, strong winds and low pressure. The promenade in Salthill has been closed as a precaution against flooding, according to AA Roadwatch. In Wicklow, gardaí are reporting that the Sally Gap Road is impassable due to snow and ice conditions. Road conditions in Meath are slushy in the Kells area, as the snow begins to melt. Drivers are being reminded to slow down and that stopping distances are ten times longer in snow and ice. The Road Safety Authority (RSA) is asking road users to check local weather and traffic conditions before setting out on a trip. Clear your windows and mirrors before you set out. Carry a screen scraper and de-icer. Do not use hot water on the windscreen as it can crack the glass. Watch out for ‘black ice’ – it’s difficult to see. Use dipped headlights at all times during poor visibility to ensure you are seen by other motorists. Remove all snow from your vehicle before commencing your journey. Snow left on the roof will become loose and can drop onto the windscreen during braking, thereby causing sudden and severe restriction to your vision. In heavy fog, turn off your radio and let down your driver’s window a fraction, so as you can hear other traffic. People travelling in strong winds are being warned to beware of objects being blown out onto the road and to “expect the unexpected”. Pedestrians and cyclists are advised to wear bright clothing with reflective armbands or belts. They’re asking being asked to take extra care when crossing the road or cycling in extremely windy conditions. Email “Motorists urged to take care as Status Orange snow-ice and Status Yellow wind warnings issued”. Feedback on “Motorists urged to take care as Status Orange snow-ice and Status Yellow wind warnings issued”.